I braved the not so crazy crowds this morning and was disappointed to not find any Hustle Jackets in my size in either Plum Shale or Power Purple (if any of you have a size 8 or 10 your not keeping let me know). There were line ups for both Lululemon and Aritzia but they moved really quickly (maybe 5 minutes to get into Lulu?) and the checkout line at Lulu was 2 minutes so it was not a bother at all. I could have just shopped from home today for better selection but it was nice to get out with my sister without our kids and brows around at a leisurely pace. I did see all the new pullovers today and grabbed the Ambition Pullover in Snorkel size 8. When I first saw Snorkel I wasn’t sure that I would like it on me but when I saw it in person today it looked much brighter and intense then I expected and really love the color on me after all. The fit is not as slouchy on me as it is in the pictures on the website so for that look I’ll have to loose a few pounds and get back on running track (I’ve been off for 4 weeks now. Blah!!) but the size 8 is comfortable and roomy so it didn’t make sense to go with the 10 as I can make the 8 fit better with a little bit of effort and motivation. I do really like this pullover a lot but I think I need to take inventory of the running pullovers I have and decide if I’m going to keep this one and sell another or just take this one back. I think it makes more sense for me to get a Hustle Jacket if I can get my hands on one. The Run Resolution Pullovers did not appeal to me at all. They have way too much going on with the ruching, microstripe and contrast details (as Luluaddict mentioned today) but the one thing I did like about it is that the running luon is much, much softer then usual. I find this is the case with heathered and microstripe items. 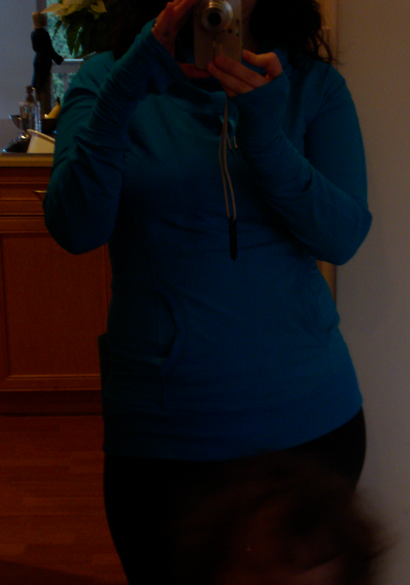 The running luon just seemed a bit fluffier and stretchier then other pullovers have been. I didn’t get a chance to try anything on though as the fitting room lineups were very long and I didn’t see anything else I wanted to try on that made the wait worth it. The Resolution LS’s where quite nice and if I didn’t already have my Inspire Pullovers I would have grabbed one of those too.